Volkswagen shares are up almost 4% in the last two days. Some have attributed this to what looks like a successful bond sale. The 2-year bonds denominated in GBP (200MM) came in at 180bp above gilts, which is impressive given the situation in the eurozone, even for an A- rated firm. There is another explanation for some of the positive momentum of the German automaker - a weak euro. For automakers, many of whom have under 10% margins, the currency weakness could be quite beneficial. Simplistically with an 8% margin, a weakening in the domestic currency of 8% could double the margins (assuming all cars are sold abroad). Furthermore it helps when the competition's currency is strengthening. That's why the currency pair to watch is euro-yen. When competing in the international markets (particularly in emerging markets and the US), Volkswagen and other German automakers have a clear pricing advantage over some of their Japanese counterparts. 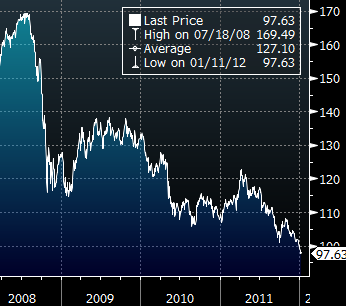 EUR/JPY has hit a new low today of 97.63. If the trend continues, it may help German automakers offset some of the losses in sales within the eurozone.